Dr Karl Bell, Senior Lecturer in History, reports on the Portsmouth DarkFest held in October-November 2016. Karl’s research area is ‘everything spooky’; his second book was on the Victorian legend of Spring-Heeled Jack and he’s now working on a book on proto-science fiction ideas in British culture between c.1750-1900. Long after the Halloween pumpkins had been extinguished, something of the thrills and celebration of that spooky season lingered on in Portsmouth last autumn. 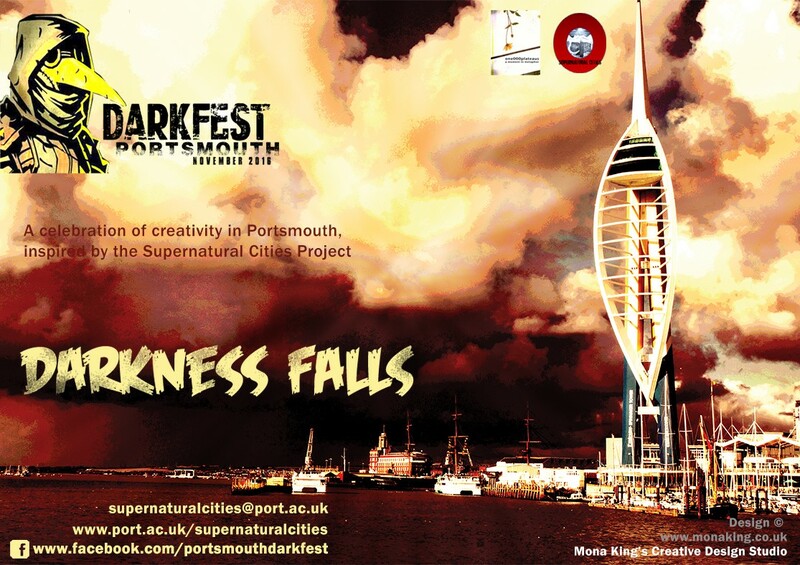 Beginning on 27th October with a talk by thriller writer and ex-SAS soldier Andy McNab, Portsmouth DarkFest, a new creative and cultural festival exploring all things dark, supernatural and sinister, ran throughout November. Led by Karl Bell of the University of Portsmouth History team, and taking its themes and inspiration from research arising from his Supernatural Cities project (www.port.ac.uk/supernaturalcities), DarkFest was the product of a close collaboration with the Portsmouth Writers’ Hub and artists from 1000 Plateaus. The festival brought together the city’s rich and diverse creative talents to explore ghost stories, urban legends, historical serial killers and ‘Pompey noir’. Portsmouth has a wealth of creative and cultural communities but they usually operate in isolation from one another. Additionally, Portsmouth tends to suffer from low cultural self-esteem when it compares itself with its south coast neighbours and other historic cities in the region. As such, part of the purpose behind DarkFest was to stimulate and unite the city’s creative communities around a shared theme for an entire month. The result was an exciting demonstration of the richness and range of talent that exists within the city. Local writers, poets, artists and musicians of all kinds got involved as they creatively explored the dark side of urban life and the human psyche. At the same time it was a great opportunity for Karl to engage the public in his supernatural research interests, topics that proved once again to have broad popular appeal with audiences. The festival was a great success, with estimates of nearly a thousand people turning up to events throughout the month. Better yet, it has inspired the local creative community to want to turn DarkFest into an annual festival. Karl is currently working with writers and artists to consider how this initiative can be further developed in 2017. Watch out for news of DarkFest’s return as darkness falls across the city this autumn.